Friday Follower Freebie Valentine's Day Edition! What it is:A limited-edition set featuring an adorable multicolored powder blush paired with two deluxe-size Lip Glazes. What it does:Embossed with hearts in three ultra-wearable shades of pink, this microfine powder has a velvety smooth finish and subtle shimmer for a natural looking blush. A duo of deluxe-size Lip Glaze shades add high shine and understated color to complete your look. I will be working on Valentines day :( but my birthday is the next day and im heading to New Orleans for a week of MARDI GRAS PARTY~! On 'Single Awareness Day' I will be at home (my day off from school) and when I pick up my little one from school, we will watch a movie of his choice and I'm making his favorite dinner, pan seared salmon with white rice and steamed veggies. I think Valentine's Day will be a lot like my New Year's Eve... the cat & I will eat something fattening, followed up by ice cream, & watch a non romantic film (maybe something with zombies). We don't really celebrate V-Day. My hubby's birthday is the 13th so we celebrate that instead. I probably won't be doing anything on Valentines Day. My boyfriend lives 200 miles away. Hey Mary! Well, the main reason Valentine's Day is special to me is that hubby and I had our first date then, fourteen years ago! So although I wasn't really into celebrating the holiday much, I really like it for that reason. I love Valentine's day !! I'll be hanging out with the love of my life, my 3-year old son. I have work and a late class Valentine's day so I won't be getting home 'till late! I'm not sure if my fiance and I will do anything. I think getting engaged (just a few weeks ago) kind of counts! I enjoy it because now that we're parents my boyfriend and I dont really have alone time but we make a point of doing something with just us two on Valentines Day. I'm not exactly looking forward to Valentines this year. It will be the first time in 9 years that I will be single. I don't have a Valentine but I do decorate for the day. I love pinks & reds so it gives me an excuse to decorate with them. Also love hearts & I have 2 deep pink heart wreaths that I put up. They're all roses & I love them. Got to have something chocolatey that day. 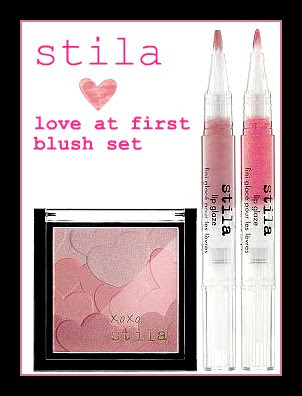 I've been wanting to try some Stila products, this would be a great start!! I am such a sucker for stuff with hearts on it. My husband and I don't really do anything for V-day either. I don't really celebrate V-day anymore, my father was buried on Valentines day the year he passed so its a sad time for me. Plus I've been married 35 years so hubby doesn't get me anything. For Valentines Day, I plan to make a lobster and steak dinner with garlic mash potatoes and a salad. I hate dealing with the crowds on V day, so we'll keep it at home this year. with all the birthdays and our anniversary in february, vday is usually low key. we get each other candy and i might make a valentine themed dinner. love reading your blog! Hubby will be busy on VDay (always happens when it falls during the week) so I'll make him make it up to me over the weekend -- maybe a salon mani/pedi is in order followed by dinner out and a movie. Thanks for the giveaway and I look forward to reading your blog. Other than buying small gifts for my kids, Valentine's Day is just another day for me. At this very moment, I'm trying to decide whether I should polish my nails red to go with the flow, or black in an anti-Valentine's protest, haha! Valentine's Day will be just another day like all the other days. I love Valentine's day ! I plan on having romantic dinner with my boyfriend. I love Valentine's day and anything Related to LOVE!!! Since I'm single I don't do anything on Valentine's Day. no plans. very pretty blush! going to go watch "The Vow" with my best friend. Hi Mary! I don't mind Valentine's Day actually. I never happened to be with someone on that day so I never celebrated it, but I'm not on the wagon of those who despise it and say it's rubbish. It mustn't be the only day in the year when you show you care for your significant other, but there's nothing shameful in celebrating it either! My hubby and I are going to celebrate St V's two days early with a special restaurant dinner in town! Hubby and I are so not romantic. We tried candles last year and decided it was too dark and lame! LOL We'll probably do quiet dinner at home with new baby and some silly movie! On Valentine's Day we usually just have a nice dinner at home. We don't make a big deal of it. It's my mom's birthday so we'll be giving her a party. She'll be 73! well, since our finances have taken a dive we'll probably share a frozen pizza! it's also my husband's birthday, but that will probably be the extra cheese on the pizza! so i really need to win this! I do enjoy Valentine's Day (it's the first year I'll have someone to celebrate it with) but no, nothing out of the ordinary on Valentine's Day this year. Won't be doing anything special. My husban usually gives me chocolates. This year I'm hoping for nail polish. Not sure what we're doing. We usually don't do much. I don't really look forward to Valentine's Day as I don't have that someone special, but it will be okay haha. I'm not a very Valentine-y person either, but I love cutesy makeup products like this! I'm not really big on Valentine's day or any holiday for that matter. I probably will be working. I like Valentine's Day--we don't ever do anything huge but we'll usually exchange gifts/cards and have a nice dinner at home. I am having a shoulder repair surgery on Valentine's Day. My husband often forgets to get me a card and if he forgets this year, he's in big trouble. I never do anything for Valentine's Day since I'm pretty much an asexual blob :P nothing planned as yet, haha. Probably just hanging out with my hubby at home; I don't like how crowded it is everywhere that night. I definitely think that Valentine's Day is overrated and somewhat manufactured but I do enjoy the fun decorations and candy. Great giveaway btw! I'm baking some heart shaped marbled red velvet cheesecake brownies. We usually go off to buy stuff and cook something new together but for this year we've decided to go out instead. Not on the 14th itself though because it gets too suffocating with everyone being at restaurants just for that purpose. I love the colors of these. We don't do much for Valentines except that I make a special dinner for the family and bake something yummy. The last time we went out if was a disaster, even with reservations so we said no more. I won't end up doing anything special. My husband and I will just jokingly say "happy valentiMes day" to each other. I'll be spending the night home with hubby and my four little valentines.